Under the shade of a tall, spreading pine tree on Main Street in Gunnison, people are smiling and grazing through their gourmet lunch in an outdoor farmhouse-like spot tucked away behind a rustic wooden privacy fence. 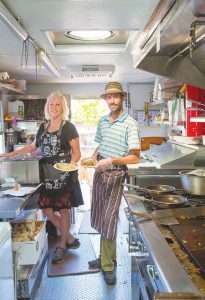 Parked on the revamped, once vacant lot is the Burnell’s Farmhouse Eatery food truck, where Kevin and Denise Reinert are cooking up savory epicurean breakfast and lunch dishes for the hungry masses. It’s a job they love, despite the long hours in both prepping the food and hovering over a hot stove in a tiny space where they can easily bump elbows. But the Reinerts have it dialed in. Their concept is different from most food trucks, with their cuisine of dishes like elk sloppy joes, shrimp and grits, southern chicken salad sandwiches with grapes, nuts and local greens, and the list goes on for lunch, and breakfasts of homemade biscuits and gravy, chicken-stuffed French toast and even huevos Burnellos. Oddly, neither of them had culinary ambition or experience other than inspiration from their mothers, who were excellent cooks. Kevin is more renowned for being a guitarist in several popular local bands, including 7th Street and Solar Junkyard, and more recently, the Beatles tribute band, Dr. Robert. He was raised in Illinois by musical parents. His mom was an elementary school music teacher who met Kevin’s dad while they were both in college band. She played clarinet and his dad blew the sax. Although Kevin’s dad branched off into real estate management, his mom continued her music, playing organ in church and as the choir director. When Kevin went off to the University of Wisconsin, his focus was on landscape horticulture with a concentration in turf grass management. “Parks, sports fields, golf courses—I wanted to be the golf guy, ” he says. He graduated in 1999, with the realization that he probably didn’t want to be in that field of work as a career. Kevin moved to Fort Collins, where his sister and two of his best friends lived. “From Fort Collins I skied I-70 and even then it was crowded. I wanted to move to the mountains to a more remote town. I remember reading an article in a ski magazine talking about how extreme and difficult Crested Butte Mountain is. I’d always heard from all kinds of people how awesome Crested Butte was so I checked out Steamboat, Telluride and Crested Butte and there was no question that Crested Butte was the one,” he says. He cycled through a few jobs, working at Flatiron Sports and Acme Liquors and then installing Poma chairlifts for a year with a crew of guys from Crested Butte, installing them in Keystone, Vail and Vancouver, He laughs that he had to work that hard to pay back the debt of skiing all winter and playing all summer. He also worked for John Collins for three years, for Tincup Construction, starting out with no carpentry experience whatsoever. Meanwhile, back in Norfolk, Va., Denise was playing a lot of sports as a kid and continuing through high school and college. Her dad was in the Navy and mom was a registered nurse. Living in the Chesapeake Bay area, Denise’s passion was sailing. “I started sailing when I was in fifth grade. I had a Hobie Cat, the splashy kind of beachy boat. It’s too cold here in Gunnison,” she says. She graduated from high school in 1980 and went to college at Virginia Wesleyan, where she studied health and physical education. After graduation, she taught in the Norfolk public elementary and middle schools for 11 years before she decided to quit her job and move to Crested Butte. She wasn’t really enjoying her job back in Norfolk and wanted a change. She knew Colorado was the place for her. Denise went through the regular barrage of newcomer jobs, working at the Rafters and the Grand Butte, but started at Marchitelli’s Gourmet Noodle in 1996. While also working at the Brick Oven Pizza in 2002, she met co-worker Kevin, who chimes in, grinning, “Denise and I had some mutual friends and I mentioned to one that I thought Denise was hot, and she still is. We went to watch Fight Night at the Rafters, where people sign up to get into the ring and box.” That was their first date. They married in 2004, having started the Elizabeth Anne B&B together in 2003. Their food truck, Burnell’s Farmhouse Eatery, is named after Kevin’s maternal family. “Mom grew up on a farm in Illinois and I wanted to do a little tribute to her and her family,” Kevin explains. Hanging on the fence that encompasses the alfresco dining courtyard that can seat up to 50 are old farm implements—windmill blades, vintage windows, a pitchfork, random knick-knacks, a proud stuffed rooster, and a whiskey barrel welcome sign. There are smaller tables and larger community tables under awnings, tents and the giant pine tree that gives shade from the summer sun. There are heaters for the inevitable chilly mornings and the cooler evening private events they cater. It was Denise who came up with the idea of the food truck. Kevin resisted but logic won out. “We knew 100 percent that we couldn’t do the house conversion but we still wanted to do food and there were no kitchens available in the whole valley, I think,” Kevin reflects. The logic of using a food truck was a no-brainer since it cost far less with its ready-to-go kitchen as just the electrician’s bid for their house conversion. They found the former Oroweat bread delivery truck in Denver, the chosen vehicle of the people who build food trucks. “We’d still be painting houses and banging nails,” they both agreed. “We have a commercial commissary kitchen, where we have a place to have the dishwasher, and a place to empty grey water. We have a four-burner grill, fryers and all the refrigeration,” Denise says, describing the kitchen on wheels that’s an all-in-one compact and powerful little space. Denise talks about the zoning aspect of what they’re doing. “You can’t be a mobile concessionaire, or a temporary commercial activity on public streets in any of the towns in Gunnison County so we had to find a property in the commercial business district, and one that was a private lot. We knew Roanne Rouse-Houck and we had heard that Jonathan [her husband] and a few others had talked about doing a food truck courtyard in this space. Jonathan is all about being community oriented, especially to increase the vibrancy of downtown Gunnison. We took that idea to Roanne, after we decided to get the food truck. We had already decided that we’d get the truck and then find a spot,” she says of their leap of faith. It took about four weeks to set up their spot, building the fence, food bar and dining area. “We took out a bunch of dead trees, turned the back fence into a gate, tearing out the old chicken wire and cleaned up all the overgrown weeds. It all just kind of happened,” Denise says rather modestly, considering all the hours put into making the area as inviting as it is. As a new business, they feel they’ve already exceeded their goals and dreams. “It’s getting busier and getting more visibility. We’ve gotten a local following in just the two months we’ve been open, and tourists who have been here for two weeks are coming every other day and some every day. We add a daily special but the main menu is constant. We started with seven items for breakfast and lunch, with some of the dishes coming from our B&B, and then most of the rest of the menu items come from things we cook for ourselves,” Denise says. 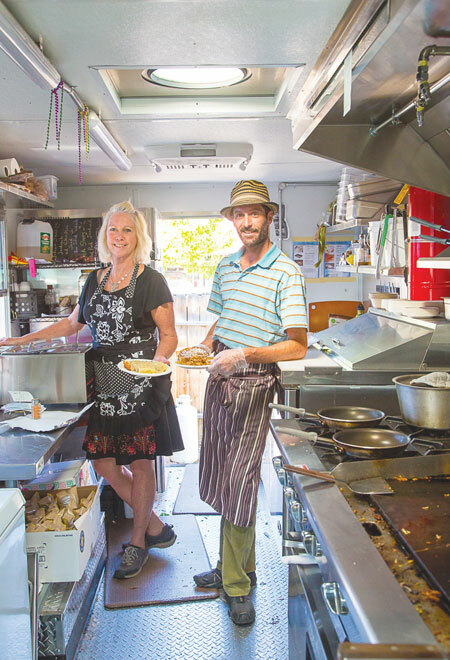 Although, they’re trying to find an indoor space for the rapidly approaching winter, like a restaurant where they may be able to co-op the space with someone, in the meantime, Denise and Kevin are happily cooking up their creations in their tiny kitchen on wheels in their magical garden.